African Violet Octave energy system is the spiritual energy of the African Violet plant and its flowers. They assist to expand your consciousness and for your spirit to travel inter-dimensionally. The energies uplift you into higher realms while at the same time increasing your own vibrational frequency so that you are able to maintain a faster/higher energy vibration while here in this reality. African Violet Octave is useful for helping your brain relax after a long day of work or after encountering dense energies. It is common for people to go within and close off their connection with Source when they come in contact with negative, depressing or energies that are difficult to be around. We naturally close off from the uncomfortable energy of other people or our surroundings for protection, unknowingly also separating ourselves from Eternal Sacred Source. This system helps you to uplift and expand, bridging once again to Eternal Sacred Source for replenishing and sustenance. It bathes you in just the right range of energy frequencies to help you relax and open up safely to the energy that made you and supports you. 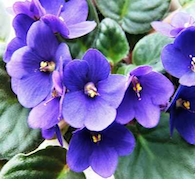 You may activate the African Violet Octave to assist you when you want to go on a Shamanic style spiritual journey. Any time you are consciously setting your awareness to ask a question or achieve a task in another realm, African Violet Octave assists you to shift your energy frequency so that you can interact in that realm.